The ME-ARC50 Advanced Remote offers the same simple push button operation of the ME-RC with advanced features and setup menus. Additional features for AC in controls and automatic generator start controls. Can store up to 10 faults in its memory. Remote allows for programming the inverter/charger and provide real time information on the LCD screen. The ME-ARC features a Favs button for storing up to five of your favorite setup menus, a Control button for fast easy control of the inverter, charger, and generator, meter button with AC and DC meters, advanced setup menus, and advanced tech menus. The easy-to-read large LCD screen and at-a-glance LEDs display the inverter/charger status. Soft keys give access to menus and a rotary encoder knob makes it easy to quickly scroll through menus and select settings. Critical settings are saved, even if the power is disconnected. 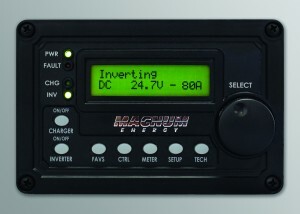 No cross platform confusion: The ME-ARC remote is the same remote used on all Magnum inverter/charger models in the ME, MS, MS-PAE, RD, MM, and the MMS Series lines.